Quick Base Exchange is a source of pre-built apps made by other users like you. When can I share an app? To share an app, you must be the app manager for the app you're sharing and you must have permission to create apps in the account. In the left column, click (more), then choose Share to Exchange. In the Share dialog, click NEXT to continue. Your original app is not changed in any way. It is copied, the data and users are removed from the copy, and the copy is marked Draft. Does sharing an app count against my account limits? No. Draft apps don’t count against your account limits. Note: If an app is not shown in the drop down, you can't share it. You will see the copy of your app with the Tips for Sharing Success panel showing at the bottom of the window. You can expand any of the tips shown on the panel by clicking the plus sign (+) in the upper right corner of the tip. Click Collapse at the top of the panel to reclaim screen space. Now you can make changes to the copy that so that it is suitable for a wider audience and will appear at its best in Quick Base Exchange. See our App sharing tips for more information. Click the Save as draft and come back later button if you need to work on other apps. The draft app will be available on the My shared appspage. Can anyone else interact with my Draft app? No, they can’t. Once you’ve decided to share an app, no one but you can interact with the Draft app. When you're ready to proceed, click I'M DONE WITH PREP on the Tips for Sharing Success panel at the bottom of the window. The Promote your app panel appears. Enter information to promote your app when it appears in Quick Base Exchange: name, description, up to three categories, up to ten tags (keywords people might use to search for your app), and screenshots that show off your app. Note that your app's name and description are filled in by default. How do I choose categories and tags that will make my app stand out? Think about how you use the app. Pick one to three categories that most closely reflect that. Enter tags (keywords) based on unique or prominent features of the app. How do I upload and manage images and documents? You can upload up to four images or documents during the process of sharing an app. Allowed formats include PNG, JPG, GIF, and PDF. Click an image placeholder (the gray square) to upload a file. Click the trashcan icon on an uploaded file to delete it. Click the Examples link for some examples of screenshots that might be useful to Quick Base Exchange users. Why should I enter information to promote my app and myself? 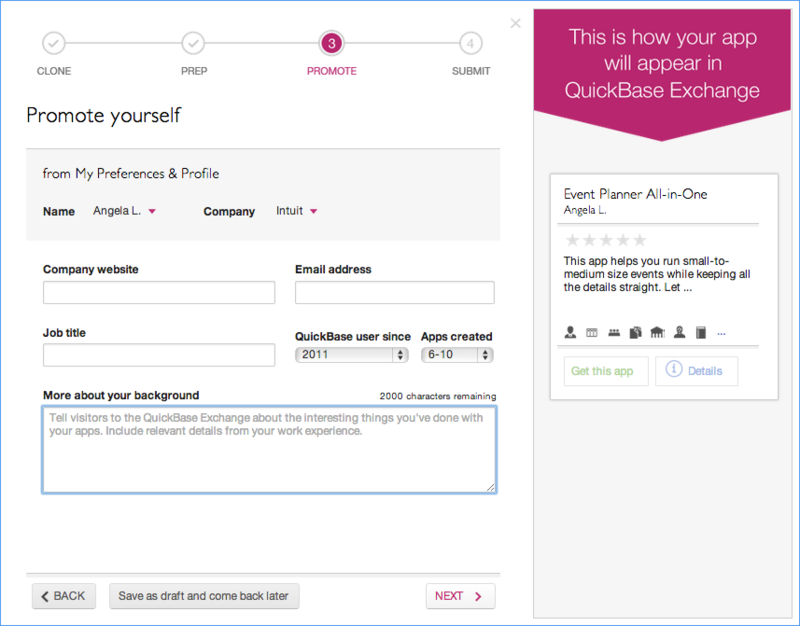 So your app will have “curb appeal” when shown with other apps in Quick Base Exchange. There will be many apps in the Exchange, and people looking for apps will tend to choose ones with details and screenshots. Click NEXT when you're ready to proceed. If you haven't taken screenshots of your app yet, you can click Save as draft and come back later to go back to your prepped app and do so. Enter information to promote yourself as a Quick Base app designer on the next panel. (You only need to do this once. 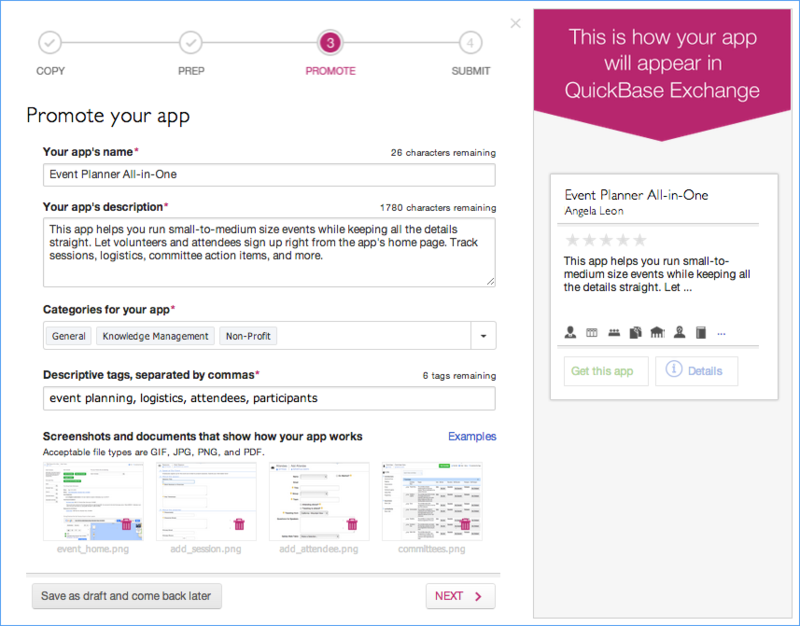 Quick Base Exchange stores the information and uses it when you submit other apps.) This information will be shown on the app's Details tab in Quick Base Exchange. Choose from the Name and Company dropdowns to determine how your name and company affiliation will appear in Quick Base Exchange. The information in the Name dropdown can be changed on the My Preferences page. The information in the Company dropdown is determined by your account setup. Enter other information about yourself, including how long you've been using Quick Base and how many apps you've created. Click NEXT when you're ready to proceed. Select the I agree to the Terms of Service checkbox, and click Submit to start the app review process. What should I expect after I submit my app? After you click Submit, the app curator is notified about your app. In the meantime, your app will be marked Pending on the My shared apps page. The app curator is a Quick Base employee who reviews every submitted app. The curator examines your app for content not allowed by the Terms of Service, and makes a decision about the state of the app. You'll get an email (typically within a few days) when this process is complete. If your app is not accepted, it will be shown on the My shared apps page with an label. Click Fix and Resubmit to continue to work on it. If your app is accepted, it will be visible in Quick Base Exchange, where it will be shown with a New banner for seven days.